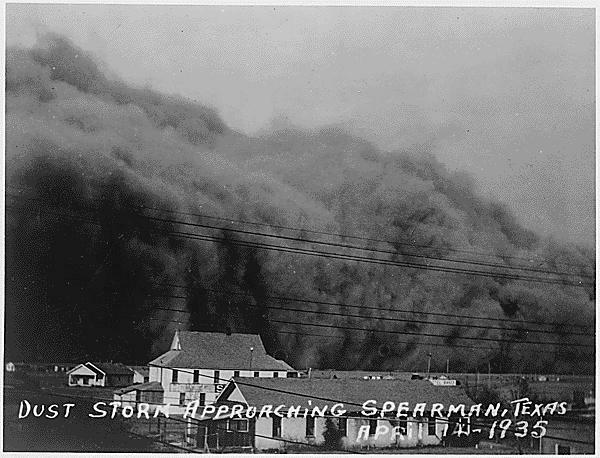 March had seen ‘dusters’ every day for thirty days straight; in Dodge City, Kansas, there’d been only thirteen dust-free days so far that year. Yet on that second Sunday in April, the morning dawned bright, sunny and clear. In the farms of the Oklahoma Panhandle, families opened up their front doors and breathed in deep. It was Palm Sunday, a week before Easter, and people hoped God was in a forgiving mood. They opened up their homes, and started to clean. Wet sheets and blankets and gunnysacks put up to catch the dust could be taken down; the tape and flour-paste strips sealing up windows and doors peeled off, and windows thrown open wide. Dust got swept and scooped out of the home by the bucket-load; roofs were shovelled before they collapsed under the weight of it; bedlinen and towels and clothing washed, and hung up in the sun to dry. People went to church – the Methodist Church in Guymon, Oklahoma held a ‘rain service’, the congregation praying for divine intervention to bring much-needed moisture. In Boise City they resumed plans for a rabbit drive, delayed a month by the dust storms. Elsewhere, families walked out to inspect their farms, the outhouses buried, the ceilings fallen in, new dunes nine and ten feet high, piled up against the fences. It was the best day of the year so far, temperatures in the 80s – shirtsleeve weather. In Springfield, Colorado, Ike Osteen cleared out his Model-A Ford, filed down the burnt spots on the distributor, got the engine to fire, and drove out to pick up his friends Tex and Pearl Glover. That same morning the sky turned purple and the winds rose, eight hundred miles to the north near Bismark, North Dakota. The temperature dropped 30 degrees as the winds picked up and blew south and south-southwest, forty miles per hour then sixty five miles per hour over South Dakota, Nebraska, and into Kansas, picking up the dry, dry dirt from the exhausted land into a roiling mass of darkness 2,000 feet high. At 2.30pm, Dodge City blacked out, the air too choked with earth for car headlights to let you even see your hand in front of your face. More at “Black Sunday,” an entry at Disturbances, a fascinating newsletter by Jay Owens (@hautepop) devoted entirely to dust. For even more, watch Ken Burn’s The Dust Bowl, and/or read the accompanying book. As we cover our faces, we might recall that it was on this date in 1962 that “The Ash Wednesday Storm” hit the the east coast of the U.S. Also known as the Great March Storm of 1962, it was one of the most destructive storms ever to affect the mid-Atlantic states– one of the ten worst storms in the United States in the 20th century. 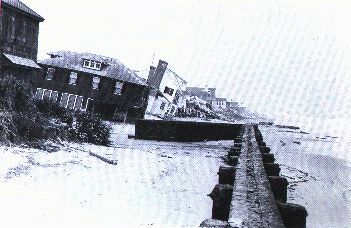 It lingered through five high tides over a three-day period, killing 40 people, injuring over 1,000, and causing hundreds of millions in property damage in six states, from North Carolina to Maine, and deposited significant snowfall over the Southeast.